Aloha! My name is Kevin Eng. I have lived in Kailua-Kona, Hawaii for 13 years, and have been a licensed Wedding Officiant since 2012. I have officiated over 1,000 weddings and renewals in the past 6 years, and love doing this more and more with each one. I have had the privilege of marrying brides and grooms from all over the world, and especially enjoy doing wedding renewals. I’ve done vow renewals for couples who have been married for anywhere from 1 year to 50 years! I believe that you don’t have to spend a fortune to make your wedding ceremony unforgettable! According to The Wedding Report, the average wedding in the U.S. this year will cost $26,029—an average of $39,948 in New York, $29,846 in Chicago, and $35,742 in San Diego. If you would like a simple, affordable wedding on a beach in Hawaii at sunset, I’m here to help. 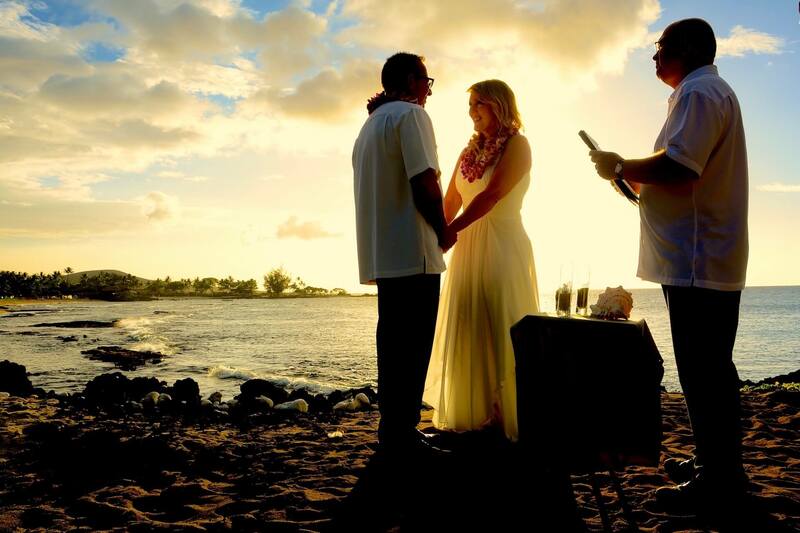 There is no place on Earth more beautiful than here in paradise, and a casual sunset ceremony at one of the amazing beaches on the Big Island is a perfect way to celebrate your marriage. Get married in paradise! My affordable wedding packages include a sunset ceremony at the beach, plus optional photography, music, fresh flower leis, and more. I’ll help you create your perfect Hawaii Elopement Package for your wedding or vow renewals. As a licensed Minister and Big Island Wedding Officiant, I offer Christian and traditional wedding ceremonies and vow renewals. I provide a standard Religious and Non-Religious Ceremony outline, but am also happy to customize your wedding ceremony as desired. Over the past 6 years I have officiated over 1,000 weddings and vow renewals. 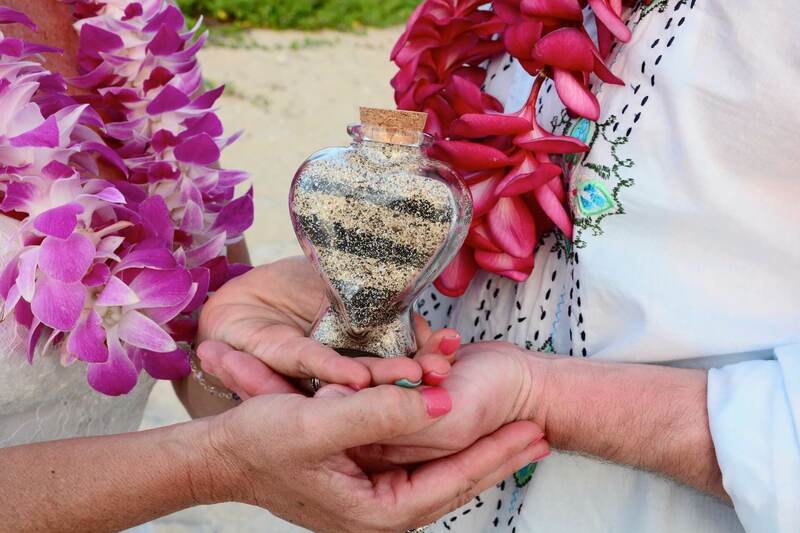 It’s a privilege to be a part of your special day and help you plan your beautiful Hawaii beach wedding. I’ll go the extra mile to make your Big Island destination wedding unforgettable. Great news! The volcano on the Big Island of Hawaii has stopped flowing (though we don’t know how long it will last). Since the active eruption has stopped, we don’t have any vog on the west side of the island, including the area from Kailua-Kona to Waikoloa. This is the area where almost all my weddings and vow renewals are held. Because there isn’t any vog, we have had the the most beautiful sunsets you will ever see. We are seeing green flashes at sunset, and the oranges, reds, and yellows as the sun goes down will amaze you. There is no more beautiful place on earth for a sunset beach wedding or renewal than here on the Big Island of Hawaii! If you would like to discuss the details of your ceremony and set a date, please give me a call at (808) 443-8172 and I will gladly answer any questions you have. I look forward to hearing from you! Whether you're ready to book your Hawaii Wedding Package, or just have some questions, I would love to speak with you! Please complete the form below and I'll get in touch for a brief phone consultation to find out how I can make your dream Hawaiian beach wedding a reality. If you'd like, tell me a little about what you have in mind for your ceremony and where you'll be visiting from.